On Sunday, November 21 the best high school basketball players in NH were on display in Plaistow for the Eastern Basketball Preseason Showcase. I am in the process of re-capping all 8 of the event's games. Next up is the Boys 2011 Game. Before this game started one of the parents said to me this game was going to be a blowout. They said I didn't make the teams even and that the Black Team was going to win handily. I admitted that while the Black Team (with guys like Madol, Holder, Fahmy, Mitchell and Colby) seemed like definite favorites I still expected it to be a close game. Well, as it turned out we were both wrong. It did end up being a blow out, but it was the White Team who ended up winning. Led by Shomari Morgan (Manchester Memorial), John Wickey (Manchester Central), Adam Goodwin (Oyster River) and Seth Cordts (Souhegan), the White team cruised to an 83-64 win. The White Team may have come up with the win, but Zach Stevens (Trinity) from the Black Team was the story of the game. Stevens was seeing some of his first game action since March when he tore his ACL in Trinity's last regular season game. Not only was he out there competing against the top seniors in the state, but he led all scorers with 21 points. This is a credit to all of the hard work and dedication that Zach as put into his rehab as well as his game. David Madol, Manchester Memorial HS – Madol stood out the most in this game because of his ability to play above the rim all game long. He scored 17 points on the game, and got them in a variety of ways. Madol got to the rim at will and finished, knocked down the three multiple times and also got out on the break and finished with some thunderous dunks. Also had a nice dunk on a put-back which not only showed skill and athleticism but also got the crowd into it. John Wickey, Manchester Central HS – Wickey continues to impress, as he once again played hard on both ends of the floor and showed a nice combination of size and skill. The 6’7” Wickey poured in 10 points, with a solid shooting stroke and an effective spin move that he uses on the break or on the secondary break. Shomari Morgan, Manchester Memorial HS – Morgan might not get as much recognition as others, but he is emerging as one of the more underrated players in this class. He is an extremely athletic player who was able to get to the rim and change direction mid-drive and even at times in mid-air. Morgan was also able to knock down the three and showed a very nice pull-up. Mike Mitchell, Milford HS – Just 4 points on the game for the lightning quick Mitchell, but if you’ve seen him play you know he’s the kind of player who doesn’t need to score to be effective. He had a number of great passes which led to baskets, distributed the basketball nicely, and also used his quickness to harass opposing players on defense. Mitchell showed a very nice crossover dribble and then pull-up on the same play. Zach Stevens, Trinity HS – He’s known as a knock down shooter, and he was just on fire in this game. Stevens was 4/5 from three, with the one miss being from about 8 feet behind the line. He is now more than a shooter though, as he hustled after loose balls and took it hard to the rim as well. Stevens also made a nice feed on the break and flat out played harder than anybody else out there. • Adam Goodwin (Oyster River) 6’5” big man (pictured above) was active on both ends, finishing with 10 points and 9 rebounds. This was as well as I've seen Goodwin play, he really was a difference maker out there in the paint. • Kyle Nelson (Milford) 6’4” forward only had 3 points, but he really made his presence felt on defense with a pair of blocks including one on Wickey. 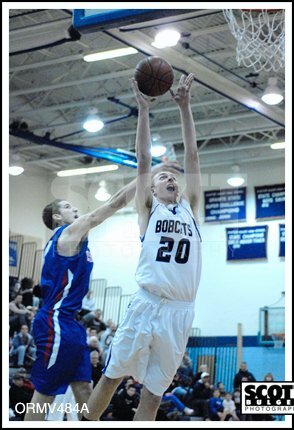 • Seth Cordts (Souhegan) Cordts always plays hard, and on this night he had a solid all around game including 15 points. Ezra Hodgson (Conant) the 6'5" Hodgson is a prototypical face-up four man, as he knocked shots from the perimeter en route to a solid 8 point game. Joe Gallant (Salem) the forward made some strong drives to the rim and showed versatility by leading the break and making some nice dishes. Shaun Munson (Winnacunnet) the free flowing, fast paced style this game was played in really favored Munson who excels in such a game as he attacked the rim and pushed the ball all game. Morgan Faustino (Dover) finished strong inside and was also tough on the boards. Greg Leblond (John Stark) made some strong drives to the bucket and also played solid defense on the outside. Scott McCallum (Milford) got out on the break and finished effectively. Jamie Holder (Milford) quiet game for the explosive Holder, but he was coming off playing a lot of games already over at SNHU. Jared Fahmy (Bedford) another player who felt the effects of the SNHU showcase, Fahmy battled in the paint and also handled the ball well for a big. Mike Colby (Londonderry) played hard on both ends of the floor and on offense he made the extra pass. Caleb Donnelly (Alvirne) Donnelly was unselfish but was also able to score if he was left alone. Adrian Edgerly (Newmarket) filling in for Dover's Kenaan Al-Darraji, Edgerly ran the point effectively for the White Team.